idth=”150″ height=”150″ />Who is it for? This is a way to revise key language and ideas from any topic. It is also a useful way to improve oral literacy and spontaneity in oral responses. I used it in Spanish, but it could transfer easily to other subjects. The idea is an adaptation of the card game ‘cheat’. The first time I used it I prepared a set of 25 different statements about one topic on small square cards and a further 15 cards with just the phrase ‘you are cheating’ on them. 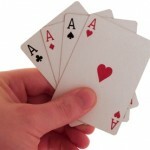 In groups of 3 or 4, students shared out all the cards, without seeing any of each other’s hand. . Taking turns, each student reads out the statement on the card, before placing it face down on the centre of the table. S/he must also get rid of all his/her ‘cheat’ cards, however, and this involves inventing another revision statement and delivering it confidently enough that others do not suspect the cheat. If someone suspects another of ‘cheating’ s/he will say ‘cheat’. If correct the cheat picks up all the cards from the centre. It not, the accuser has to pick them all up. The winner is the one to get rid of all his/her cards first. I was not sure whether it would feel like a ‘game’ but it did. Students were just as engaged in trying to second-guess the cheats of others as they are in the card game of the same name. As I allowed students to see all of their own cards, one thing that a couple of students started to do was to use as ‘cheats’ a close adaptation of the revision statements they already had in their hand, rather than invent new ones. In Spanish, and given that this was the first time through, I did not view this negatively. In future games I resolved either to increase the proportion of cheat cards or have all students drawing cards one by one from the centre instead. The activity certainly worked well as a first revision activity but I felt more could be gained by having students create their own games of cheat by writing the revision statements themselves. In a subsequent lesson students worked in groups to produce their own versions of the game. Games were then swopped to be played. This took longer than I had allowed but was a more challenging development and a very good revision activity. In future attempts I am going to insist that they play the more difficult version with all the cards face down in the centre, whereby each student draws one in turn. This means that the student has to react even more quickly and cannot base answers on other revision statements s/he can see.